The Mercury event was held at lower Manhattan’s Chelsea Piers on the Hudson River. “I’m so excited! I’ve never been this close to Lady Liberty before,” said media rep Sally Turner. A Mercury Marine media invitation to New York to ride on a bunch of fantastic boats in the middle of a blazing hot Northeastern summer? The seductive premise of such an inquiry is inviting on its own, and one only assumes that some amount of press conferences will be involved to unveil a new product. Except no new product was being debuted; zero press conferences or PowerPoint presentations were scheduled. 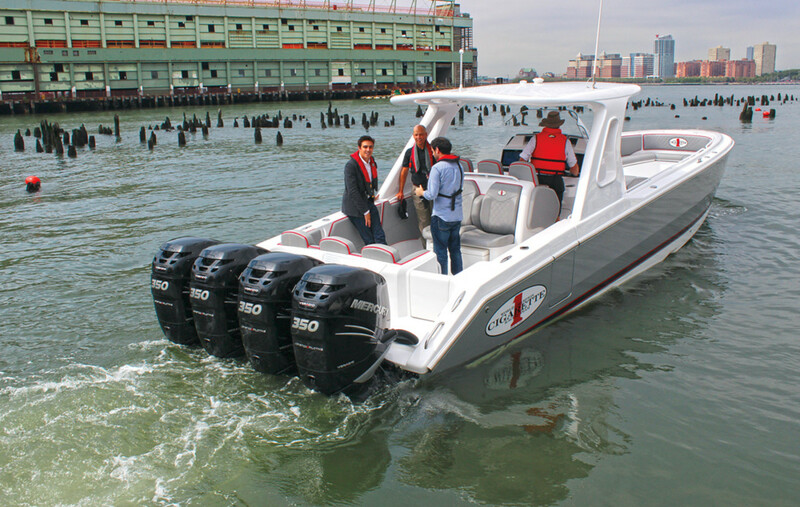 In a style similar to Discover Boating events that tempt non-boating industry media and mom bloggers to hop on boats and gush either live or later to readers and viewers about the experience, Mercury Marine was not debuting a product when it lured members of the non-boating media to MarineMax’s Chelsea Piers location on Aug. 1. The company simply wanted non-boaters to sample, firsthand or via the media outlets, the technology that has exploded during the past five or so years — such as Active Trim, Skyhook, Joystick Piloting for Outboards, and VesselView Mobile. The tools have made boat handling so easy that even a novice can be comfortable commanding a 35-footer. 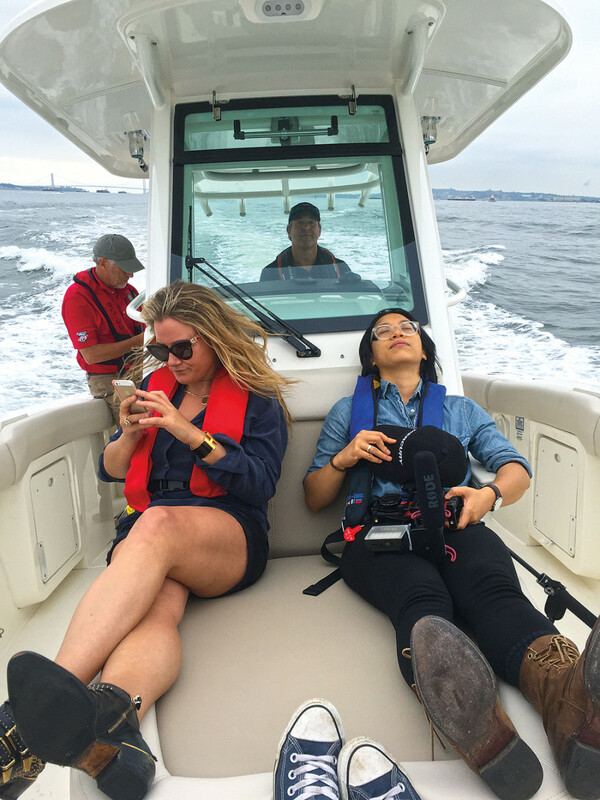 Mercury invited representatives from about a dozen popular media outlets to try it for themselves on the Hudson River while enjoying a legitimately cool breeze and escaping New York’s oppressive heat. Instead of mom bloggers, Mercury tapped popular millennial live-streaming outlets that have a huge social media presence, as well as more traditional news sources. The New York Times sent Clay Risen, a father who brought his two young daughters along for the ride and says he also plans to pitch a story to Fortune, another publication he contributes to. Also in attendance were representatives of National Public Radio, Popular Mechanics, Forbes.com, Jalopnik, Gear Patrol and NowThis Media, all of which are based in or have bases in New York. Huffington Post and Complex.com, a pop culture website dedicated to music, style, entertainment, sports and sneakers (yes, sneakers), were waylaid and have make-up events planned, says Mercury Marine spokesman Lee Gordon. All took turns piloting and learning about a Scout 320 LXF powered with a pair of 350-hp Verados, outfitted with Active Trim, Skyhook, VesselView Mobile and Joystick Piloting for Outboards; a Boston Whaler 280 Outrage, powered by two 300-hp outboards, that included Active Trim, Joystick Piloting for Outboards, Skyhook and VesselView Mobile; a Sea Ray 31 Sundancer with a MerCruiser 4.5L MPI; a Harris Pontoon Triton with a 150-hp engine; and if the amount of video footage is any indication, the most popular boat of the day — a Cigarette 39 GTS with four 350-hp Mercury Verados. Many people older than 40 likely have never heard of NowThis Media, which includes NowThis News, NowThis Future, NowThis Election and so on. But collectively the Facebook media websites have tens of millions of fans. About 13,000 people tuned in to the live-streaming video that Sally Turner and Mia Fermindoza teamed up to provide for NowThis Future’s Facebook page, which has almost 2 million likes — many of them from millennials. Sally Turner (left) and Mia Fermindoza take time out from streaming to Facebook to enjoy the ride. Mercury hopes their reporting will attract more millennials to boating. Within a week the nearly 15-minute video from aboard a Boston Whaler, bobbing at virtual anchor before the Statue of Liberty, had been viewed more than 65,000 times. That almost begs the question: How much would it have cost a boat- or engine-building company to reach 65,000 people, many of them under the age of 40, with video from a trusted source giving a basic explanation of the almost surreal things a boat can do these days after the past 10 years of innovation? When Mercury put together the idea for a mainstream media event, it went out of its way to invite more than obvious news outlets. “I’m so excited! I���ve never been this close to Lady Liberty before,” she says before interviewing Mercury Marine’s Steve Fleming and Travis Hayes live on NowThis Future. After streaming from the boat, she and camerawoman Fermindoza sprawled out on the bow’s sun loungers. “This is amazing,” Turner says while tapping her phone’s screen, presumably tweeting, answering questions on the Facebook post or otherwise engaging with her legions of fans. Skyhook, Mercury’s GPS-enabled virtual anchor, and the quiet engines seemed to be the winners of the day. Jalopnik reporter Kristen Lee marveled at the quad Verados on the Cigarette boat. “Gone are the days when you have to throw a big anchor overboard,” Turner tells viewers. Fleming notes that this is a big deal for people who are trying to fish a spot. Mercury Marine president John Pfeifer later tells Lee that before virtual anchors, a person would have to sit and sweat out keeping up with the currents and the wakes and everything else that would cause the boat’s position to fluctuate. 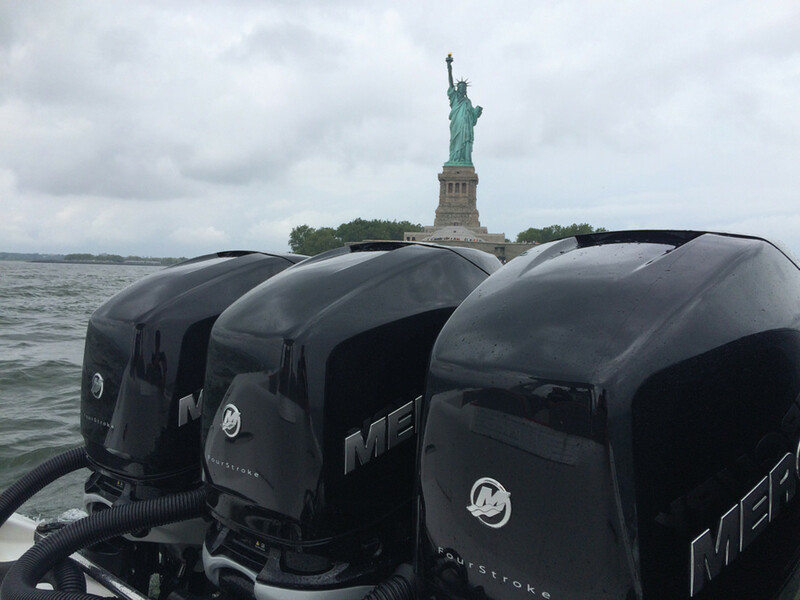 Mercury Marine will continue to hold events such as the one in New York to help spread the word to the public that issues such as docking and engine trimming — traditionally seen as barriers that prevented novices from taking up the recreation — have been virtually eliminated by new technology. “We’re trying different events to do a better job of giving people access to exploring new intuitive controls,” Pfeifer says. Explaining that you can anchor a boat with the touch of a button does not have the same effect for novice boaters as allowing them to try it themselves. “We’re trying to do a better job on the marketing front,” Pfeifer says. “If you don’t experience things like the joystick or Skyhook, you don’t understand. Skyhook takes all the stress and anxiety out of having to sit perfectly still to allow a boat to pass or to fish a spot because it can cause anxiety, even for commercial operators or experienced boaters. Pfeifer tests Mercury’s new products with his teenage children to make sure they seem intuitive, and the company works hard to ensure that each engine either eliminates unpleasant noises or instead makes a sound that’s pleasant to the ear. The Brunswick Corp.-owned company is undergoing another phase of expansion, having just broken ground on a machining upgrade that will add 30,000 square feet to the plant. Every facet of the facility has been upgraded, and this should get it to the point that it can keep up with the demand for large engines. The company also will invest in research and development, Pfeifer says. Mercury will continue meeting consumer demand for more power.